I'm trying to improve a bit "grubinst.exe" and "grubinst_gui.exe". 1. The window is now a DS_MODALFRAME instead of a WS_POPUP, meaning it can't be resized anymore. Which it's a good thing, because resizing doesn't help the user, on the contrary. 2. 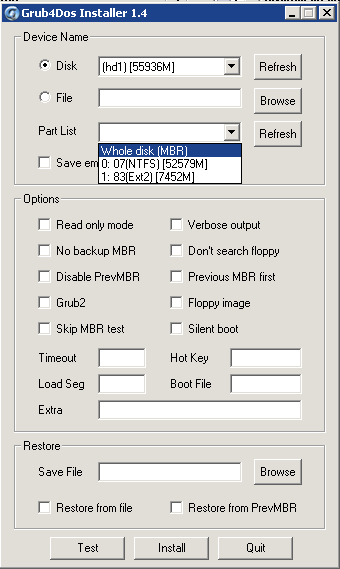 In the Options groupbox I added 2 checkboxes: "Skip MBR test" and "Silent boot". The first one is adding "--skip-mbr-test" to the command line, the second is adding "--silent-boot". 3. If Device "File" is used, it is adding quotes to the path to file in the command line. This way you can use even a file name with spaces in it. 4. When the user is clicking on the first Refresh button, the Part List combobox is cleared. 5. When the user is choosing a disk in the first combobox, the Part list combobox is not just cleared; the disk will be scanned for partitions and the list will be added to that combobox. 1. Added 2 application flags: AFG_SILENT_BOOT (16384) and GFG_SILENT_BOOT (16). 2. Added this to "--help" switch: "--silent-boot It will display messages only on severe change(s) and/or error(s).". 3. If "--silent-boot" parameter is used, GFG_SILENT_BOOT is added to 0x80 in grub4dos MBR. 4. Removed duplicate "else if (! strcmp(argv[idx],"--skip-mbr-test")) afg|=AFG_SKIP_MBR_TEST;". Now I have to actually modify the grub4dos MBR in the code. 1. In grubinst.c I can search for the messages in the grub_mbr variable and replace each of their chars with \0. This is easy to implement but it is not so professional and the result will not be 100% complete. 2. Modify the asm code from grldrstart.S to not display those messages when the 4th bit in 0x80 byte is 1 (or to display the messages when the 4th bit in 0x80 byte is 0). But this is not that easy. Grubinst_GUI does not display any drives unless run as Admin - maybe adding a manifest file would help? Tooltips or a help screen would be nice to explain the options - or maybe just run grubinst with --help option so user can see switches? grub_mbr final code size is < 30 sectors when installed - if it reaches 32 sectors there will be problems installing to a 32 SPT drive, so you need to be careful about increasing code size. I have previously asked chenall et al. for silent switches for booting and for grldr and they were very resistant to it as they 'need' to see any messages etc. in case of errors, etc. I would prefer it if there was a 'debug key' which the user could press on bootup (e.g. L-CTRL) which would display all messages but otherwise it was silent. 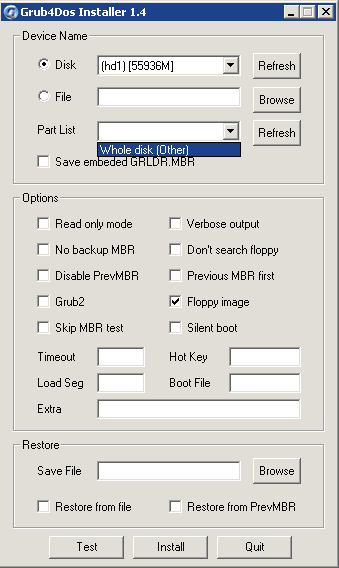 I modified the grubinst code a while ago to make the MBR more 'bootable' - the modified version of grubinst.exe is in RMPrepUSB. Normal installation of grubdos to the MBR means that the MBR sector starts with a non-standard sequence of bytes - it seems that some BIOSes actually look at the first few bytes for a 'valid' jump instruction and thus these BIOSes won't boot to grub4dos! Unfortunately, grub4dos uses some of the initial bytes in the MBR as flags (e.g. timeout, hotkey scancode, etc.) and so by adding the extra 'compatible' code bytes to the beginning of the MBR, it shifts these flag bytes along. So I had to modify the grubinst code to accommodate for this change too. I think maybe this is why people have more success when using RMPrepUSB to install grub4dos than just using the unmodified grubinst?? I am using Win 8.1 64-bit system and running as Admin. Unfortunately, to properly get the information about drives and/or to write the MBR you need direct access. If F1 is pressed then "grubinst --help" is launched, or, better, its output can be redirected and shown in a normal window. Another solution: the "normal" messages could be "stacked" in a buffer. When a severe error occurs, the buffer will be displayed + the current error. This error appears because grubinst_gui uses the old WinExec function instead of a newer one like CreateProcess(W). Only CreateProcess(W) is able to start another process with the same security context as the calling proceess. I will try to implement it also in grubinst_gui. Another issue: I'm thinking of adding a new switch "--force-standard-mbr". Or at least to try to improve the filesystem type detection in get_fstype function. Because it's not working properly. For example on all my USB flash drives and on the mounted virtual drives grubinst is saying "Unknown image type". No matter which combination of parameters I try, can't install grub4dos. However, if in code I force the use of a standard MBR, all is fine. Grub4dos finally boots and the drives show no error. I replaces WinExec with CreateProcess. Could you please test to see if the problem is solved? Thank you. That's strange, on my Windows 7 x64 (UAC activated, started as admin) works fine. - on success, "grubinst.exe --read-only ..." displays "The MBR/BS can be successfully installed". - if grubinst_gui fails to start grubinst.exe it will show an error code. If you could actually explain to me (I am a bit tough ) what is the connection between filesystem and choice of MBR code , and you could define WHICH code is to be intended as "Standard", I may be able to help. their only scope is to chainload the bootsector of the primary partition marked as "boot" or "active" in the partition table. The (original) connection was made actually by the author of get_fstype function by using this name ("get file system type") and by using as result FST_MBR, FST_MBR2 and so on. The new option I added assign a FST_MBR result when this function fails. This way the rest of the code can continue to install the Grub4Dos MBR/BS. I know that "standard MBR" is not that good to describe it but couldn't find a better one (for now). Sure, we know that *someone* of the original Authors of the tool coded that, but - with all due respect to all involved - at least the way you explained it, it simply makes no sense whatsoever (to me at least). Since usually the good guys that wrote those tools write very "sound" code, at least from a "phylosphical" point of view, I suspect that (while there is the possibility of a mistake by everone) that *somehow* the intention was not that of changing the MBR type depending on the filesystem(s) found but *something else*. In any case, personally I see little advantages in that, if I were you I would rather write a grub4dos grldr.mbr installer (if you feel like one is needed) rather than fiddling with the old grubinst code. the first sector of it, the "proper" MBR, has three "holes". responsible for searching all partitions for grldr and when found, loading it. Currently supported partition types are: FAT12/FAT16/FAT32, NTFS, EXT2/EXT3. partition type(0x85) is not fully tested for the search mechanism. How to write GRLDR.MBR to the Master Boot Track of a hard disk? 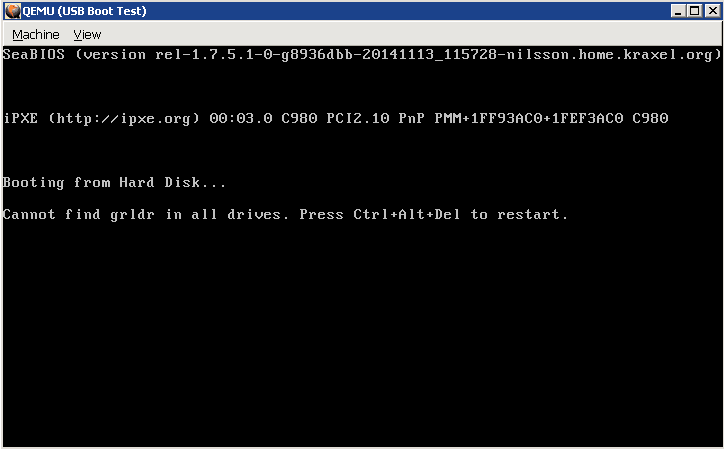 Microsoft FDISK, it may be copied onto the second sector of GRLDR.MBR. "previous MBR" will be started. now simply write GRLDR.MBR on to the Master Boot Track. That's all. Six bytes can be used to control the boot process of GRLDR.MBR. 04h	2	hot-key code. high byte is scan code, low byte is ASCII code. the default value is 0x3920, which stands for the space bar. of previous MBR. See "int 16 keyboard scan codes" below. As I see it, anything else is NOT needed. Maybe you want - as an option - to provide an alternative "standard" MBR code, and if this is the case, I would suggest you to use the Syslinux one, which is surely freely redistributable. and see what gets on the other side unshaved/unscathed . grubinst.gui - Still get 'Can't run the background program Error 2' - but now I also get the error on the Test button too! Oh - wait a minute - I didnt have the grubinst.exe in the same folder!! Maybe you should test for that or give a better error message! Error code 2 = "file not found". Very briefly tested, but it seems like working flawlessly on my XP SP2. The command line grubinst does not provide any hint about usage. The command line grubmenu has two options -r and -k but there is not a description of what they do. It would be a good idea if the README_grubinst.txt was included also in the "binaries" archive and if a minimal README_grunbmenu.txt was added. The GUI grubinst button text "flipping" between Install and Extract when the "save the embed(d)ed GRLDR.MBR" checkbox is checked/unchecked is not very "intuitive" IMHO. Would be great if you could add in my mod too which adds 2 bytes to the beginning of the MBR??? The old version displayed the command line when Test button was used. This was very useful. Can you show the command line first before running grubinst in Test mode? Maybe not 100%, but since the current operation (when it's checked) is to save/extract GRLDR.MBR, it's not logical to have to click on "Install". I will take a look at the code. Just post it here. But right now I'm thinking at a way to make grldr read the MBR byte where the options are stored (including --silent-boot) and not show those unnecessary messages on screen. The problem is I have to make it work in any situation: current MBR style + new grldr, new MBR style + current grldr, your current MBR style + new grldr and so on. Because of these I have chosen to modify grub_mbr in grubinst instead of modifying grldrstart.S (for the time being). Let me know if link doesn't work. odd? I can download using Incognito browser?